Down in the Dry Tortugas you will see quite a large amount of bird species. There is a recorded 300 species that have been recorded on the islands and it is estimated that on any given trip you can see about 70 different species. It's a good idea to bring some binoculars to catch birds higher up in the air and on the islands that are a little further off. One of the most curious and strange-looking birds that you will see on the islands is the frigate, also known as the Magnificent Frigate. The Magnificent Frigate is noticeable for scarlet-colored throat pouch that becomes inflated during breeding season. These are the males. The scarlet color is extra prominent against the pitch-dark black of the rest of the frigate's body. These feathers are actually black but become iridescent and are seen as purple when the sunlight hits the bird directly. The females are also black but their lower neck and their breast are white. Undeveloped frigates also have a white head in addition to their white body and lower neck. Furthermore, if this wasn't enough to be able to pinpoint the Magnificent Frigate, you can look for them as the silent bird while in flight but listen for a strange rattling sound while the bird is in its nest. These birds are typically found in tropical areas around the Atlantic like the Dry Tortugas but also including Florida, various Caribbean islands, and the Cape Verde Islands. The bird was once called the Man O'War due to its speed and its piracy over other birds while in flight. 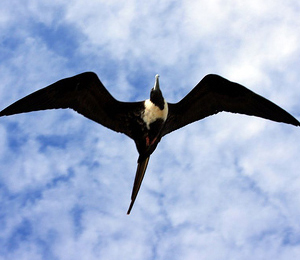 The best time to see the largest number of birds in Dry Tortugas is the springtime.